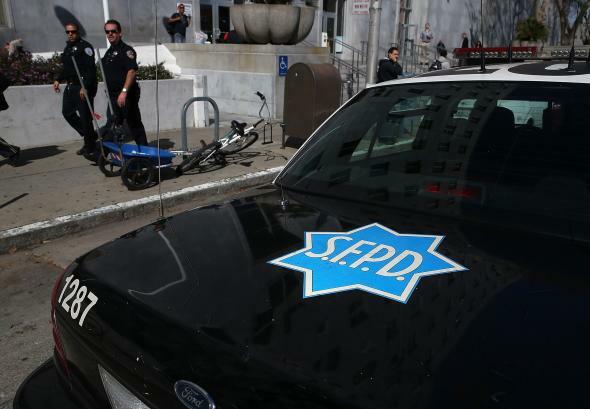 Justice to review San Francisco police amid discrimination complaints. A police car sits parked in front of the Hall of Justice on Feb. 27, 2014 in San Francisco, California. The Justice Department announced Monday it will be reviewing the use of force procedures and practices of the San Francisco Police Department, at the request of city officials and community leaders. The two-year audit is unlike the more stringent DOJ civil rights division investigations in that along with being voluntary, the review will not result in a court-mandated legal settlement, just recommendations. Other police departments, such as Baltimore, have undergone similar DOJ reviews to try to address issues of racial discrimination and preempt a formal DOJ civial rights investigation. The San Francisco departmental review comes after a video showed city cops shooting and killing 26-year-old Mario Woods in Dec., compounding complaints of racism on the force by community members.